To facilitate the creation of tomorrow`s model citizens, schools today need the very best of infrastructure facilities. Located in the heart of Vijayanagar, Bengaluru, about 5km from the city railway station and within walking distance from the Vijayanagar bus and metro station. Sri Sarvajna Public School has a spacious campus measuring 3353 sq. We have a well-planned library facility that houses vast collection of books and other learning materials. The facility`s diverse collection of books aims not only at nourishing what is taught in classrooms, but also helps the child to be imaginative and gain interests outside the curriculum. 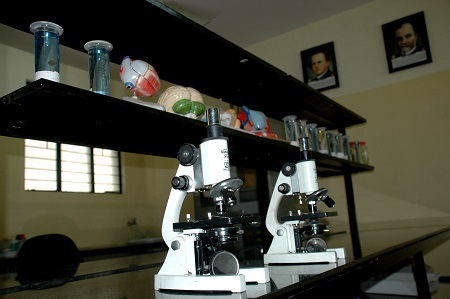 Our school laboratories built the interest of practical learning in students. The well-equipped and well-maintained laboratories are designed to hone student`s practical knowledge and skills. Our sophisticated computer lab can accommodate a good number of children at a given point of time. Sports and outdoor activities play a critical role in the physical and intellectual development of a child. Children need adequate physical activity to lead a healthy and productive life, because a healthy mind is a result of a healthy body. Playing sports also helps the children to socialise and become better leaders. Our cognitive centre is a place where children obtain skills through activity based learning. The cognitive centre has a student-friendly setting to enable them to learn at their own pace and excel. As a healthy practice to keep oral infections at bay, we regularly organize dental camps for students from class 1 to 9. Professional care is important for the holistic wellness of students; as healthy habits should be inculcated in the initial years of their growth to make it part of the lifestyle.